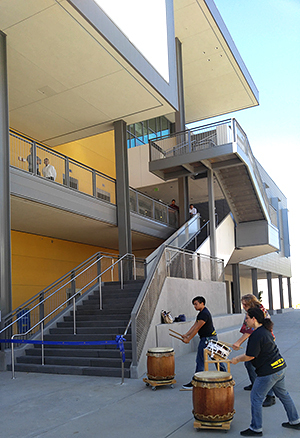 Members of the UC Merced Foundation Board of Trustees and other campus leaders and supporters got a firsthand look at the university’s newest building during a ribbon cutting reception Wednesday, June 22. The Classroom and Office Building 2 (COB2), with more than 77,000 square feet, will provide classrooms, tutorial space, research labs, space for scholarly activities, and academic and administrative offices to support the campus’s projected growth needs for interdisciplinary instruction, research and activities. The building will open for classes in the fall. Jill Robbins, dean of the School of Social Sciences, Humanities and Arts (SSHA), said the building will be a boon to the school’s faculty and students. One of the building’s highlights will be the Merced WAVE (Wide-Area Visualization Environment), a state-of-the-art, immersive, interactive virtual reality space comprising several large 3D displays mounted in a half-pipe configuration. Once installed and operational, the system will be the highest-resolution of its kind in the world. UC Merced researchers will be able to use the WAVE to visualize and interact with their work, and to enhance their teaching. As part of the Pacific Research Platform, the WAVE will also enable UC Merced researchers to access visualizations from other, similar installations around the world. COB2 also boasts a 90-seat Technology Enabled Active Learning (TEAL) classroom, which will provide a rich, collaborative learning space that allows students to work in small groups with shared technology and instructors to deliver lectures and coordinate group activities. The building includes lecture rooms of 210, 150, 120 and 90 seats, as well as six classrooms for 24-student sections and additional seminar and instructional rooms. In total, COB2 provides 840 instructional seats. As with all of UC Merced’s buildings, environmental sustainability was a key priority in the construction of COB2. The building is on track to achieve platinum certification from the U.S. Green Building Council’s LEED (Leadership in Energy and Environmental Design) program, and it has been designed to outperform California’s stringent energy code by 30 percent. Chancellor Dorothy Leland said the building’s opening is yet more proof of UC Merced’s momentum, with the campus recently breaking ground on its new Downtown Campus Center and announcing the developer for its ambitious 2020 Project, and Wednesday’s event was a chance to thank the people who help make that growth possible.